REPORTER: Mr President, are you putting what you're calling the alt-left and white supremacists on the same moral plane? TRUMP: I am not putting anybody on a moral plane, what I'm saying is this: You had a group on one side and a group on the other, and they came at each other with clubs, and it was vicious and horrible, and it was a horrible thing to watch, but there is another side. There was a group on this side, you can call them the left. You've just called them the left, that came violently attacking the other group. So you can say what you want, but that's the way it is. TRUMP: I do think there is blame - yes, I think there is blame on both sides. You look at, you look at both sides. I think there's blame on both sides, and I have no doubt about it, and you don't have any doubt about it either. TRUMP: I watched those very closely, much more closely than you people watched it. And you had, you had a group on one side that was bad. And you had a group on the other side that was also very violent. And nobody wants to say that, but I'll say it right now. You had a group - you had a group on the other side that came charging in without a permit, and they were very, very violent. I do think there is blame — yes, I think there is blame on both sides. You look at, you look at both sides. I think there’s blame on both sides, and I have no doubt about it, and you don’t have any doubt about it either. 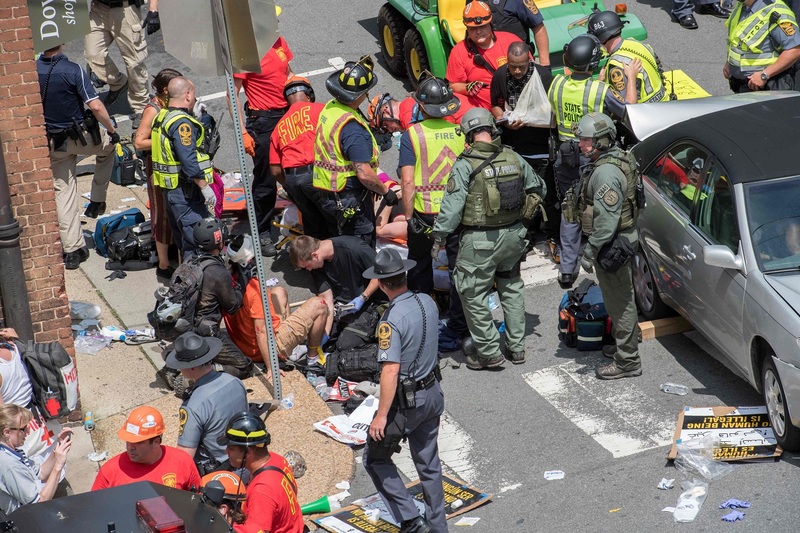 An angry US President Donald Trump refusing to condemn the alt-right following events in Charlottesville, where an alleged neo-Nazi supporter rammed his car into a crowd of counter-protesters, killing a woman, Ms Heather Heyer, and injuring scores of others. No one is born hating another person because of the color of his skin or his background or his religion... People must learn to hate, and if they can learn to hate, they can be taught to love... For love comes more naturally to the human heart than its opposite. Former US president Barack Obama in a series of tweets quoting former South African president Nelson Mandela. 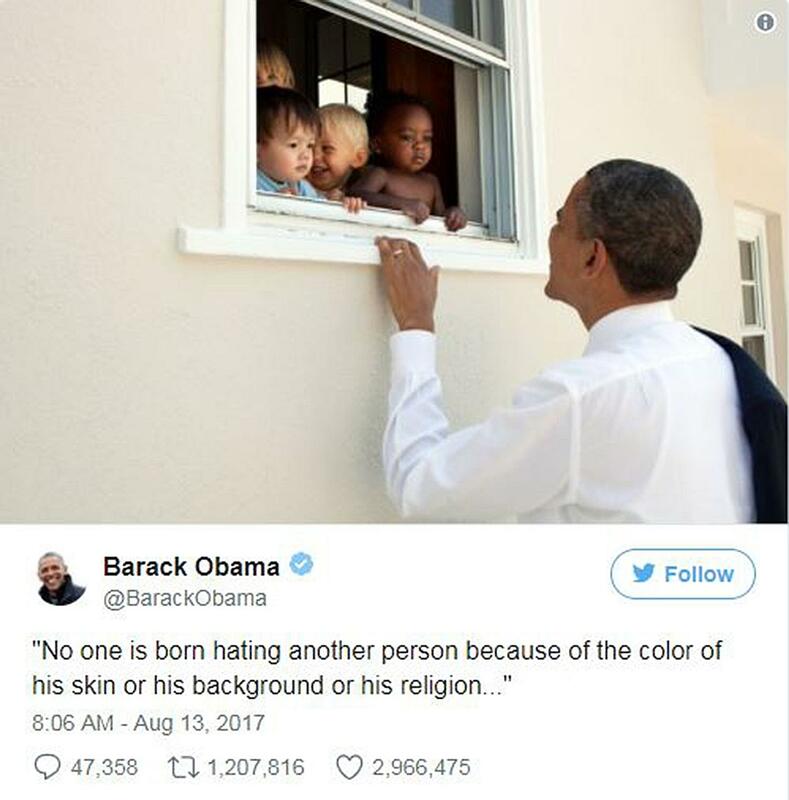 The first tweet, which shows a picture of Mr Obama smiling at four children, has been retweeted more than one million times and liked 2.6 million times as of Tuesday afternoon, a new Twitter record. Around 3pm, Mr Trump condemns the violence saying he blames "many sides"
Mr Trump sparks another political firestorm when he doubles down on his initial response to the violent white supremacist rally saying there was "blame on both sides"
WASHINGTON US President Donald Trump's extraordinary 23-minute news conference at Trump Tower elicited a near-universal rejection from across the political and cultural spectrums. His comments shocked even normally unflappable American newscasters. One bright note for Mr Trump: He impressed a right-wing news site.